Happy Holidays!!!!!! I hope you are enjoying all of the wonder and beauty that December and its celebrations bring! You’ve got to trust me on this. If you’re looking for a cookie that you can devour without feeling like you’re going into sugar/fat/carb/calorie shock, these cookies are IT. Each cookie is about the size of a bakery-bought chocolate chip cookie (like from Publix) and has 53 calories, 1.3 grams of fat, 2.75 grams of sugar, and 7 grams of carbs! Oh and did I mention these are gluten-free? Can I get an AMEN? If you’re looking for a cookie to bring to a cookie swap or party, these cookies are IT. If you’re looking for a cookie to gift to that friend that you want to impress with your culinary skills, these cookies are IT. Don’t like cranberries? Leave them out! Prefer walnuts? Go for it! Chocolate lover? Add some dark chocolate shavings! These chewy on the inside, crisp on the outside cookies are super versatile. Now go and make these! In a large bowl, whisk flour mixture, sea salt, baking soda, and cinnamon together. Set aside. Using a mixer, whip butter, sugar and vanilla extract together until creamy. Make sure to scrape the sides of the bowl as you whip. Add eggs and honey to the butter mixture. Mix until incorporated, scraping the sides of the bowl as needed. Slowly add the flour mixture into the butter mixture, a cup at a time, and beat until just combined. With a spoon or spatula, fold in cranberries and pecans. Refrigerate for at least 30 minutes. While it sets, pre-heat your oven to 375. Roll into walnut-sized balls, then gently press into a slight disc, then place 1 inch apart on a lightly greased non-stick cookie sheet. Bake at 375 for 11 minutes, or until golden brown. Transfer to a cooling rack and enjoy with #allthemilk. Don't forget to leave some for Santa!!!! 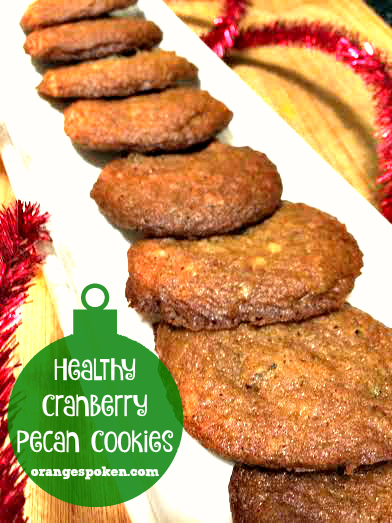 This entry was posted in Recipes and tagged gluten-free cookies, guiltless christmas cookies, healthy christmas cookie swap recipe. Bookmark the permalink.